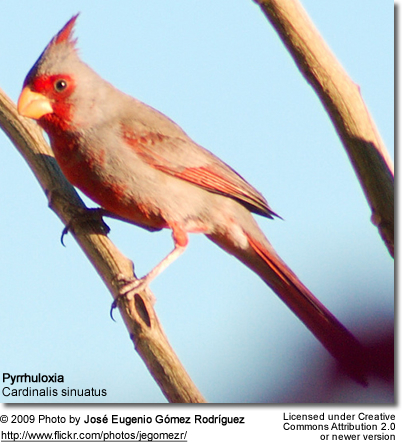 The Pyrrhuloxia (Cardinalis sinuatus) - also commonly known as "Desert Cardinals" - are medium-sized songbirds found in desert areas of Mexico and USA. 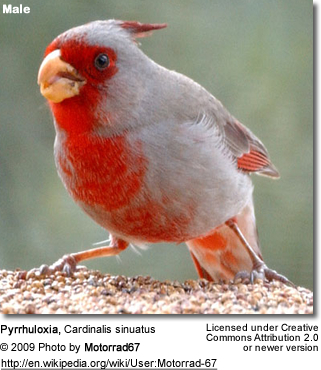 Desert Cardinals measure 8 - 9 inches (21 and 23 cm) in length, including the tail, and have a wingspan of 10 -12 inches (25 - 31 cm). They weigh between 1.5 - 1.7 oz (42 - 48 g). Males and females have distinct plumages, with the males having more red markings and the females being mostly greyish-brownish in color. Both the male and the female have an orangey / reddish beak and a prominent raised crest. Juveniles look like females. Young males will grow in bright red feathers as he matures. 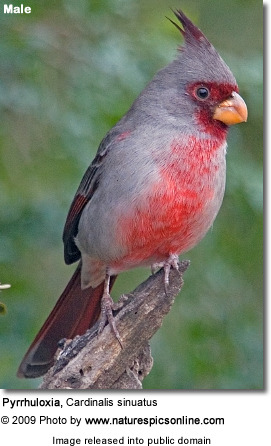 Desert Cardinals occurs primarily in Mexico, but can also be found in the southern parts of the United States, specifically in Arizona, New Mexico and Texas. They received their common name for the desert habitats that they inhabit. 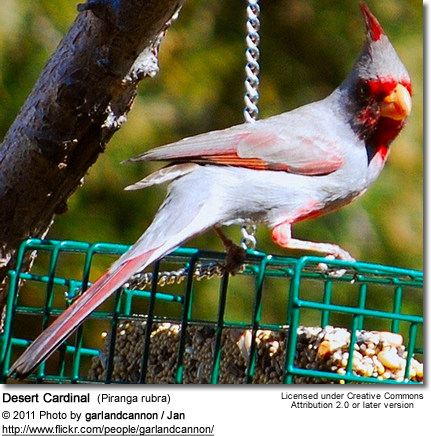 Desert Cardinals typically mate for life. As part of their bonding behavior, males will collect food and feed the female beak-to-beak; or - during the breeding season – he will carry nesting materials, such as twigs, in his beak, taking it to the female to build the nest with. She will crush the thin twigs with her beak to make them pliable, and then pushes them as well as tree bark under her body into a cup shape with her feet. She lines the nest with plant material, such as grasses, stems, rootlets and pine needles. Nest construction usually aces about 3 - 9 days and is generally about 2 - 3 inches (5 - 8 cm) tall and 4 inches (~10 cm) across. The nests are usually well-concealed in dense shrub or a low tree about 3 - 10 feet (1 - 3 meters) off the ground. She builds a new one each season. When nesting, he will feed the female as she is sitting on (incubating) the eggs. About one to six days after completion of the nest, she will lay about 2 - 4 glossy white eggs with a slight hint of .green, blue or brown, and marked with lavender, grey or brown blotches. Even though the female does most of the incubation, the male may take over for short periods. The young hatch after about 12 - 13 days and will fledge (leave the nest) another 10 - 11 days after hatching. Both the male and female feed and care for the young. They usually produce several clutches each year and the male may continue raising the young, while the female is incubating the next clutch of eggs. Pairs use chipping noises to locate each other, or to warn each other in case of approaching danger. 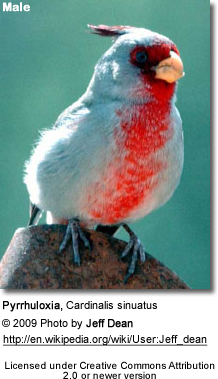 Cardinals mostly feed on seeds, which make up about 90% of its diet. They typically forage the ground. They will also eat various insects, snails, as well as fruits and berries. Those species occurring in North America will drink maple sap dripping from tree holes made by sapsuckers. Chicks are almost exclusively fed on insects, as they have a higher requirement for protein than adults. 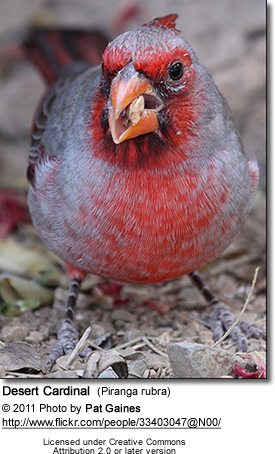 The oldest wild Cardinal lived at least 15 years and 9 month. One captive bird reached 28.5 years. Chicks have a high mortality rate as they are commonly preyed on by other birds, reptiles or mammals.